This article by Julius Evola was published in February 1939 issue of La Vita Italiana. Duke Colonna di Cesaro was an Anthroposophist, with whom Evola had had a long relationship, dating back to their participation in the Ur and Krur groups. While they both sought to understand the “third dimension” of history, their approaches ultimately differed. On various occasions, in this very journal, we insisted on the necessity of a radical revision of the methods and criteria by which history is made, in the order of common teaching and of that culture that claims to be, and it alone, “serious.” We showed that history, packaged in such environments, does not grasp the two dimensions of the surface of true history and leaves itself completely devoid of the third dimension, that of depth, where the essential meanings and the truly determining causes of so many events are concealed. Finally, we indicated the inherent absurdity, today, in insisting so much on the Roman tradition, on its symbols, on its vision of life and, at the same time, in continuing to consider the world of Roman antiquity with the usual glances lacking erudition, archeology, philology, or criticism. As things stand, we were brought to consider with interest, and almost with avidity, the most recent, weighty work of Duke Colonna di Cesaro [Giovanni Antonio Colonna di Cesaro, Il Mistero delle origini di Roma (The mystery of the origins of Rome), 1939] since from the first pages a different spiritual and let us even say initiatic scheme is announced, of the study of the origins of Rome and of the meaning that the rise of this fateful city had in the history of the world, Nevertheless, after the first moment of immediate interest, at the point of deepening the central thesis of the book, we were struck by a perplexity, derived from the thinking of a peculiar juncture of motives, about which it will not be useless here to say something, at the end of a clarification of the methods and otherwise of the dangers peculiar to an investigation in depth of history, as it is that, according to what we have already said, we ourselves hope for. The work of Cesaro constitutes a valid and living contribution along the line on which the most valuable representatives of the new Italian culture should be fought, in all of its introductory part, in which the truly adequate criteria of every exploration of the origins are made precise. Cesaro justly blamed the error consisting in examining ancient history through the eyes of modern man instead of seeking to adapt to the same ways of feeling and seeing characteristic of the subjects of that history; therefore also consisting in considering as valid and positive documents only those that were encountered in the rationalistic, positivist, and contemporary secular spirit and in judging as irrelevant, fantastic and inconsistent everything that, in ancient traditions, is instead symbol, myth, legend, allegoric, where even here the center of traditional consciousness fell and the knowledge proper to the great, the wise men, and ancient priests was realized, “to those who, in modern terms, could be called the directing classes of remote antiquity.” On such a path, Cesaro, coming to so much through a broad and acute close critical examination, defines the possibility and the necessity of integrating the order of the usual historical researches with a research following new interpretative methods of a spiritualist, initiatic, and metaphysical character. In the process of the origins, myths, symbols, and legends are produced not impracticable, fantastic processes, but rather of fantastic processes brought about by something spiritually real and positive. Legend and history are strictly connected; the former proceeds through interiorization and is deployed by means of images, and the latter proceeds by exteriorization, in facts and events. The images are the result of living formative forces; the facts are organised by human thought. There, one is carried away by formative forces; here, there is a thought-out coordination of facts. But the legend is the invisible part of history, it is the root of history; it is not poetry, rather, it is a more vast reality than history itself. The threads of the destiny of a people that are untied invisibly in the most various ways in their historical development, rise to the impulses, to the creative spheres, with which the heroes of its legends were tied. Therefore, the latent consciousness or memory of the same mission is conserved in legends, and is handed down to those who, in later times, will be capable of recognizing it, which, on a spiritual, super-historical plane, a people and a civilization had on its own. Where they cease to have value as positive documents of the material history of the origins, they assume that of the documents, no less positive, of their spiritual history. As we noted, we consider it salutary that these criteriological views of a traditional and anti-modern type were reaffirmed decisively by Cesaro and, to tell the truth, not in terms of simple statements, but on the basis of a serious close examination of criteria adopted by various contemporary historical-mythological schools and of a persuasive assessment of their one-sidedness and insufficiency. Yet, at the same time, it is regrettable that Cesaro, at the moment of passing to the application of the principles and therefore of exploring the secret of ancient civilizations and of Rome itself, finishes in positions of questionable consistency, thereby giving ammunition to his adversaries and critics that seek at every occasion to demonstrate the arbitrariness of the constructions of whoever departs from their presumed serious, positive criteria. To indicate what it is about, we will say that when an argument like that which Cesaro clarifies in the introductory part of his book is confronted, it is not possible of stop at compromises, to formulate conciliations. There exist some modern exponents of the hoped-for methods of Cesaro — we will cite Dacque, Bachofen, Wirth, Baumlet, and in part, even Vico — but that does not prevent that in its essence this method ought to be called traditional, that is of pertinence to a mentality irreducible to everything that is modern and informed by principles and the consciousness of a super-individual character, completely detached from everything that is the construction or interpretation of individuals. Now, whoever wants to pass coherently from the statement to the application, it is necessary that from views and teachings equally traditional he draws his guidelines, his points of orientation, and nourishes a fundamental suspicion towards everything that feels the affects any modern influence whatsoever. Such, unfortunately, is not the case with Cesaro. In the reconstruction of that secret spiritual history of the origins and mission of Rome, the part played by the fascination of an Anthroposophical or Steinerian type is too evident. We are not certain of the philistines capable of being alarming as soon as one speaks of occultism and theosophy and to seize in this regard, as do so many dilettantes, the watchwords of hebraism and masonry. In La Vita Italiana where systematically we are clarifying the ideas to serve as guidelines for the new fascist culture, in regards to the study of the “occult powers” and even also very recently in the writing of Arthos published in a preceding article [on the occult war ], there was occasion to indicate what should be thought in regard to forms similar to “neospiritualism.” It is necessary to see in it a vague desire for the recovery of some traditional conceptions, however associated with the dross of every type and especially of those deformations which often entirely falsify the original meaning and that, in the field of the “occult war,” are destined to throw disrepute and ridicule also on those traditional views, partially and inadequately taken up, in themselves. In such terms it is necessary to nourish a fundamental suspicion of all the modern forms of spiritualism and esoterism; which should be subjected to a severe discrimination that will confirm the legitimacy of the ideas being raised in it only in the measure in which these find exact, rigorous, and univocal confirmation with traditional conceptions, the patrimony, one in its essence, but various in the forms of expression of pre-modern wisdom. With that, we don’t mean that, in a field where a living knowledge must have a fundamental part, everything must be reduced to a type of scholastic exegesis and that every intuition would have to be banned. Instead, we mean that the aberrations of which the above mentioned schools and cults in modern times give us a great abundance of examples, impose, in this regard, a criterion analogous to that of the Catholic Church: which leaves to the mystics the freedom of personal excursions in the supersensible, however with the provision that the corresponding results are conformed to dogma and traditional teaching; without which, a verdict of “heresy” will be pronounced. Now, on the basis of an “orthodoxy” that, by being differently defined and of a more subtle and impalpable order, is not less rigorous than the Catholic one, on the basis of a traditional “orthodoxy” in the higher sense, heresy can really be denounced, the heresy of the great part of the new swarming forms of occultism, theosophy, neo-mysticism, and modern Rosicrucianism. This is certainly not the place to discuss Steiner and to make precise the importance of his doctrine—on that, we have already written in one of our works, Maschea e volto dello spiritualismo contemporaneo [Mask and Face of Contemporary Spirituality]. Here, instead, only the highlights can be mentioned, which are those Steinerian views, which noticeably influence Cesaro’s interpretation of the origins and mission of Rome. They certainly belong to that which, in such an author, from the point of view indicated, must be considered heretical or heterodox, insusceptible, in any case, of being in conformity with traditional teachings; they are the fruit, instead, of an individual interpretation, therefore arbitrary like those of various modern philosophies of history. We will note only some of the main points. Cesaro’s merit is his ability to recognize the importance, for the exploration of the origins, of the fundamental opposition of the myths, cults, and symbols of an olympian-uranian character, solar, virile, heroic and regal, to those that are telluric, chthonic, infernal, lunar, feminine, and priestly. But even here, Cesaro overlooks two important points. 1. It eludes him that this opposition is not to be considered, in an absolute way, originary, but rather consequentially, inherent to the phases and determined cycles of civilization, during which eras a process of involution and dissociation already occurred. The primordial cycle of hyperborean civilization, progenitor of the principal forms of the Nordic-Aryan civilization, was superior to and anterior to similar oppositions. So, for example, for the point of view that is of more interest to us, there was even a synthesis between the regal and sacerdotal elements, between spirituality and virility. The ignorance of this point constitutes a serious preliminary question, for its allowing a margin to evolutionist ideas, like those that have a fundamental part in the Steinerian ideology. 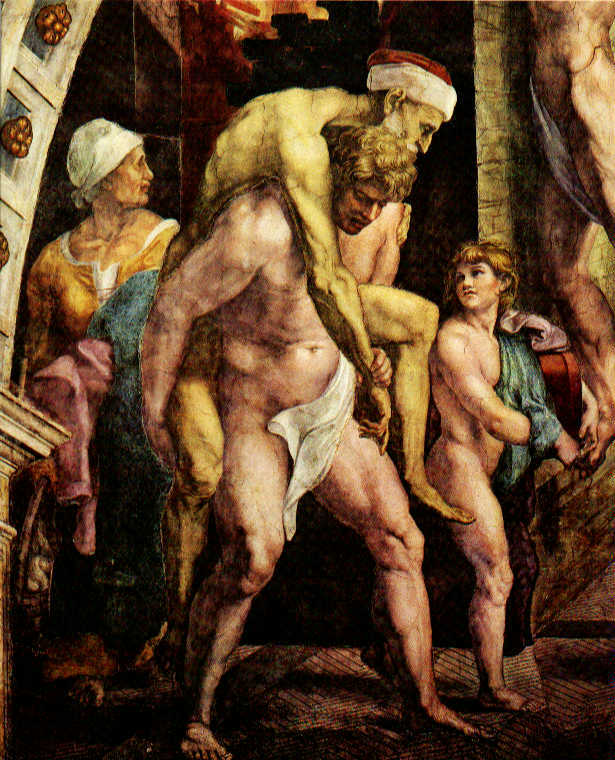 Hesiod’s teaching, which finds an exact confirmation in a series of other Aryan traditions, speaks clearly in this regard: the civilization of the heroes does not constitute an innovation nor, in any case, progress, but rather a restoration, a return, a taking up again of the primordial Olympic tradition entered in a phase of involution. Instead, it is really a progress that, in heroic forms, to which the same Roman civilization itself belongs, which Cesaro recognizes; therefore, since he starts from the above mentioned opposition, he erroneously considers it originary and investigates the points in which, in history, there had been a surpassing of it. The true value of Rome is instead a restoration, an attempt to take up again in a universal body an original spirituality of the hyperborean and solar type, an abortive attempt at the moment of the putrefaction and asiatization of the empire of the Caesars. 2. In every way, even in the reference to the stages in which the mentioned duality constituted the dominant motive, Cesar overlooked an important element, which is the relation of the visions and cults, of one type or another, to different racial factors, mixed or coming into conflict in the events of the origins. In place of trying to interpret the transformations of the various civilizations and the various religious ideas in this way, Cesaro conceives a type of general abstract development, of an evolutionary character, strictly adhering to Steinerian schemes. The real problem is that the same methodological value and the same significance of the oppositions we indicated, in a similar way, turn out to be almost irreparably compromised. The predominance, and almost the arising, at a given moment, in ancient Mediterranean spirituality, of cults of a telluric, feminine-demonic, Dionysian character, opposed to the heroic and Olympian forms, does not signify for Cesaro that which must be thought even from an almost positive point of view: a type of reconquest of the substratum of inferior pre-Aryan and anti-Aryan races and civilizations against higher forms, issuing from the primordial traditions that, initially, had subjected them (for example, in Greece with the descent of the Dorians and Achaeans). For Cesaro, that signifies instead an evolutionary phase in a general predetermined process, predetermined no less than for the coming of Christianity. Now at this point, those issues must be raised, that spiritually—our friend Duke di Cesaro will permit us to be sincere—have a subversive character. We said that in such a placement the very meaning of the opposition between the Olympian and telluric elements remains distorted, since Olympian spirituality is not conceived as it should, that is, as the state of consciousness of a type of solar and regal super-humanity, conserving intact the light and the power of the origins; rather it is interpreted as the state of a dreaming spirituality, external to man, pre-personal, anterior to the sense of the Self, passive because it would have been conditioned by the tie and the heredity of blood, race, family, caste or tradition. A variety of modern interpretations of the evolutionist type on the same lines of Darwinism and Freudianism is therefore fully revealed, since even if, at the origins, the beast or the reign of the forms of the libido is not assumed, one always sees there something “less,” something that, through a development propitiated, by whom nobody knows, (according to Steiner, by disincarnate entities which would only be concerned with the events of men not yet evolved), must be surpassed to lead to true consciousness, to true humanity. Consequently, the rising of the telluric cult does not have, for Cesaro, the sense of a contamination, rather that of an interiorization: it is the disappearance of the transcendent gods of the Olympian cycle, it is their becoming, as chthonic gods, something immanent to the earth, dwelling at its center as a new interior consciousness of man, as the impulse toward the formation of a human and independent individual Self. It signifies neither more nor less than the sanctification and legitimation of the anti-tradition and the revolution in the spiritual world, that subversion, propitiated by contaminating crossbreeding and by the ferment of inferior races and cults, that already made the ancient Mediterranean world appear here as a world of ruins. And that this assertion is not extreme results from the fact that Cesaro connects the meaning of evolving stages, also to everything that is critical and rationalist thought, individualism, the destruction of the ties of blood and soil, secular and only warrior civilization, rebellion against every earlier form of authority from above. Behind the symbols, meanings of the type he seeks to recognize in the Trojan war: the fall of Troy would express the end of an era, the era of traditional sacred wisdom, a descent from the memory of the ancient stages of a formless participation in transcendent divinity, and the “beginning of a new era, of science conquered with the will and with individual reasoning” of the “Self freed from the chains of consanguinity that lay at the base of the psyche for the collective form of the ancients.” But the germ of ancient wisdom was not destined to perish, but rather to be transmuted, to give rise to a new cycle, and which would be the meaning of the legend of Aeneas, a refugee from Troy who survived its destruction and was the bearer, at its foundation, of the heritage of that of which Troy was the symbol. Aeneas lands in Italy, and from him, in the legend of the origins, begins a new cycle corresponding exactly to the Roman civilization and to the Roman mission of the history of the world. Here, naturally, we cannot even mention the laborious exegesis made by Cesaro with the purpose of including all the symbolic and legendary material of the first Romanity, up until the closing of the cycle of the Kings, in a similar scheme. Moreover, it is worth mentioning that he avoids the same possibility of again finding the right way for a type of indirect road, which is that of the improbable, evolutionary views. In fact, even admitting the mistaken premise, he would have been inclined to give consideration to the Roman cycle already as a synthesis, as a surpassing both of the presumed, impersonal and priestly primogenial wisdom, as well as the opposite purely individualistic, critical, and warrior principle, in something higher and solar, that naturally would not have meant a conquest and an evolution, but only a rebirth of the true force of the origins. That would have constituted, let us repeat, in an indirect way, a bases to really discover the deepest and secret meaning of so many solar, heroic, and heroic aspects in the institutions, cults, laws, even in certain simultaneously historical and symbolic deeds of Romanity. But not even that is verified: what there is in Rome that is truly, specifically Roman, Cesaro in fact considered it as a mere preparation, as something valid not in itself, but in so far as it paves the ways to the other, to the Christian gospel, considered by him as the “fulcrum of the evolution and of the history of humanity.” And if one adds that in Christianity itself above all, Cesaro seems to valorize these aspects, for which such a religion presented at the origins of the really revolutionary, anti-traditional, universalistic and subservient traces, one can well imagine where he is going to finish. Rome became the instrument through which ancient humanity, divided on vertical lines, according to ethnic groups and descendants of consanguinity, one moves, fragmented by individualism, towards a horizontal solidarity, towards a brotherhood that must not know distinctions of race, people, and family. The ancient collective spiritual patrimony of men rises up through the will of the individuals. Races, peoples, families, through individualism, make themselves humanity. The ancient racial and family conceptions of love, of innate and implicit love in natural communions, are transformed, through egoism, tempered by the forces of individualism in universal love. In other words, Rome had a historical mission, insofar as it was made the instrument of ethnic chaos, a leveling universalism, and a cosmopolitism deadly for the preceding, differentiated types of civilization: in so far as it was that which Gobineau or Chamberlain had called “semitic Rome.” And Cesaro sought to recognize even in Roman origins such a blessing, interpreting the legend of the asylum given by Rome to every type of people at birth, and thus to those of a lower class, according to a spirit that would anticipate the Christian preference for the rejected, the disinherited, those without tradition. Therefore, the valorization of Rome on Cesaro’s part is really a valorization in reverse. In all these aspects of Rome, its cults, ethics, customs, symbols, laws, in which we, from the traditional point of view, recognize, in these enigmatic but also unmistakable forms, the resurrection of the remote Nordic-Aryan spiritual heritage, Cesaro sees, or should see, “traditional residues,” debris of a past destined to die, which Christianity had to give, prior to a preliminary ethnic chaos, the coup de grace. With Christianity, for him, the new truly solar era would be opened up. Ever since, no more mysteries, unless as residues of ancient cults destined to disappear; no more occult initiations, to conquer the immortality of one’s own individuality, which now is virtually the heritage of all. In that there is, not only in the ideas, but even in the words, the reproduction of Steinerian digression in the centre of the philosophy of history. By way of such aspects, we see—it is clear—in the Middle Ages an awakening of the true forces already acting in Nordic-Aryan Romanity, of its true solarity, propitiated from such a resurgence or rebirth from a new contribution of Aryan blood: but Cesaro, coherently, should see in that a “time of the stopping” of evolution, in order to recognize instead the resumption of progress in phenomena, such as the Reformation, Humanism, the French Revolution, and, (why not?) liberalism, modern democracy, Jewish internationalism: in fact not before this point, i.e., the final fall of the West, the Self is truly liberated from tradition, blood, caste, traditional cults, dogmas that have become in truth empty words, and then he is truly self-conscious, detached from everything, actually ready to create, from nothing, a new civilization on the base of a freely willed universal communion. Some may say that we are exaggerating: but it is difficult for Cesaro’s friend [Evola himself] to demonstrate here that Cesaro’s premises, i.e., those of Steiner, rigorously thought out, are sufficient to lead to so much. We don’t want to be considered tendentious and therefore we will emphasize that in Cesaro’s thought (as also in Steiner’s), this immense centuries-old destruction, of which western history was miserably the theatre, would have brought about, in the end, a good, in view of a new civilization and a new spirituality. But hypotheses of the type, in truth, are a bit too gross. Since it is certain that a destruction happened, this needs to be called by its true name: tomorrow we will be able to pick ourselves up, we will be able to surpass this decadence—the idea of the so called “cyclic laws” and of the “avatars” is characteristic of traditional conceptions—but that will never be able to and later never lead ourselves to allow what happened to be considered as providential, to justify it in terms of phases of a higher evolution. We are in addition aware that, when it will truly surpass what should be surpassed, the modern world will not reach new heights that the inferior humanity of the past could not know, but, simply, it will return to “normal,” it will know, although in different forms, what it had already known and possessed. These elements are not to be considered as “achievements,” but rather as residual fragments of the great primordial solar tradition, or echoes of it, resonating in an historical setting quite unfavorable to the goal of the actual protection of their purity and their deepest meaning. And it is appropriate, at any rate, to explain the fact that such solar elements in Christianity lost their original metaphysical importance and assumed only a religiosity, at the most theological, and that it is no longer connected to the mysteries and to a true and proper hereditary sacerdotal caste, but were only points of reference for a general faith and heritage of a clergy enlisted without any condition of blood and race. Even this difference is important for its practical consequences. In fact, while the evolutionists, starting from their premises, even here will grant themselves an arbitrary digression, thinking up this or that “new” form of “Christian initiation,” (and something similar even claims to furnish the anthroposphic doctrine of Steiner, close to Rosicrucian wishful thinking), which instead poses as tradition, will measure the current value of Christianity and its possibility to contribute to a future spiritual reconstruction like the susceptibility, from among the solar elements present in it, to integrate it into a wider order of the solar primordial tradition, to what can be legitimately applied the saying quod ubique, quod ab omnibus, et quod semper [that which is accepted everywhere, by everyone, and always]. And in this order, undoubtedly, an essential convergence will be verified of the positive element of Christianity with that which it had that was great, virile, Olympian, whether the authentic pristine Romanity, or the greatest forms of the common Indo-European and Aryan civilization. Because of this confusion of motives and applications, we therefore said of Cesaro’s work that it can engender only a sense of authentic perplexity. And it is truly a pity because the quality of the criticism and exegesis that the author demonstrates are indisputable, and the clarification of the lacunae that official history leaves open and for which a higher interpretation is imposed there, is conducted with mastery. That such a work has therefore not been able to have the significance and the value that, otherwise, would have been proper, that is accordingly to be ascribed to the load of the deleterious influence that, in one way or the other, and even in perfect good faith, the modern occult and theosophical so-called neo-spiritualism does not cease to wield in a cultural world disorientated in respect to true traditional spirituality, like that of the modern West. 1. Steiner’s and Cesaro’s conception, according to which the ancient, pre-Christian civilization would have known only collectivist and impersonal forms of spirituality and initiation, is inconsistent, not only from the initiatic point of view, but even from that of positive [scientific] research into the history of religion. It would be enough to remember that, that for example the Indo-Aryan civilizations would know the double way to immortality, (1) the Olympian, solar, and celestial way of the gods (deva-yana) and (2) the way of the fathers (pitri-yana) tied to the earth and collective blood. This twofold division corresponds, in a certain way, to the distinction between the Greater and Lesser Mysteries of classic antiquity. It is evident that, for polemical purposes and to give consistency to the evolutionistic-Christian interpretation, the two authors act as if antiquity had known only the way of the fathers and similar forms that, if they were also present in the ancient world, they were nevertheless relegated to inferior social strata or races.